The wearable tech firm Jawbone has been accused of being insensitive and distressing to people whose fathers have died. The US company sent out an email to thousands of recipients with the subject line: "Re: Your Dad". The header was intended to be an attention-grabbing way to promote its products as Father's Day gifts. But it sparked criticism from dozens of recipients on social media, one of whom said it had induced a panic attack. "It was so personal, and at first it was even hard to tell what that email was about, unless you looked further beyond the subject line or looked at the sender," Diana Sargsyan, a marketing student whose father died five years ago, told the BBC. "I immediately thought: What about him? Who in the world would send me an email about my dad? I got a little scared even. "Ever since my dad has passed, I've been dealing with a lot, which includes depression, anxiety, therapy, you name it. Only for the past couple of months I've been feeling better, and this email just crushed me." Jawbone declined to comment and has not publicly replied to the criticism on Twitter. But a charity suggested the ads should have been better thought out. "We know how distressing this period can be for bereaved people and would welcome companies taking the time to think more about the headlines of their email marketing campaigns and the impact these have on bereaved people," said a spokeswoman for Cruse Bereavement Care. Jawbone's ads risk causing it additional bad publicity at a time when questions have been asked about its future. Reports suggest the San Francisco-based firm is trying to sell off its speaker business and its chief executive recently felt compelled to issue a statement denying rumours that it planned to stop making hardware altogether. One advertising industry expert suggested the "backfired" emails had not helped. Image caption Jawbone's chief blogged earlier this month that it was not "exiting the wearable business"
"It's important that companies using email marketing campaigns respect the intimacy of people's inboxes," said Maisie McCabe, acting UK editor of Campaign. "When planning any activity, brands need to consider the potential pitfalls. "In this case, Jawbone should have considered how people whose fathers have died or are estranged from them might view such a subject line. "The situation has then been compounded by their failure to respond to the criticism quickly and decisively." 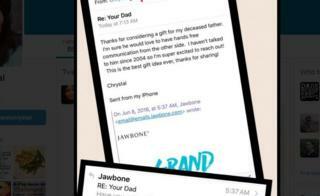 Update: A spokeswoman for Jawbone has said it is contacting people who have complained on Twitter and sending them the following statement: "Like many other brands, we wanted to celebrate dads for Father's Day. We do understand the sensitivity around the subject line used in our email and will be cognisant of this moving forward."